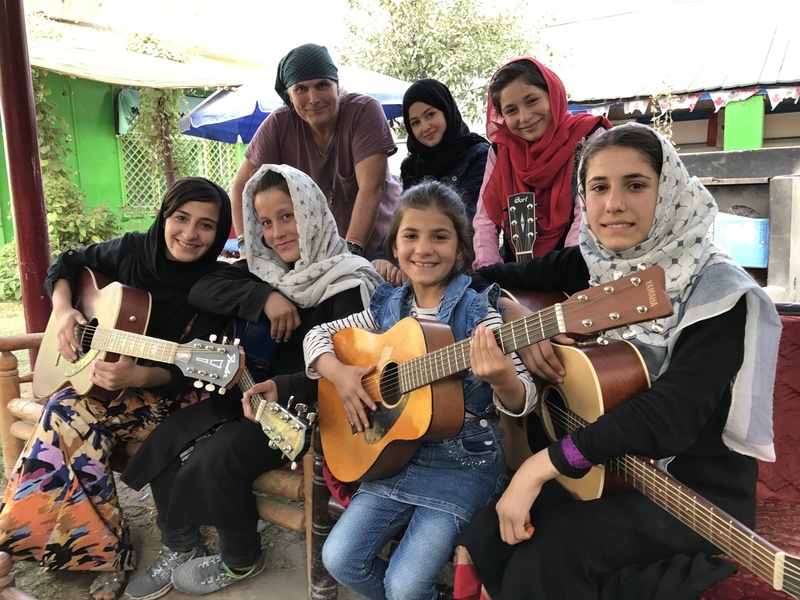 An American Rock Musician Teaches Guitar To Kabul's Street Kids : Parallels Lanny Cordola has played guitar with Guns N' Roses and the Beach Boys. Now he devotes himself to teaching music to Afghan street children, most of them girls. He also helps pay for their schooling. The Miraculous Love Kids music school founder Lanny Cordola (top left) stands with Madina Mohammadi (top center), Mursal (top right) and other students outside their rehearsal space in Kabul. Their favorite song is "Fragile" by Sting. "What we're trying to do with music is not singing and dancing and fancy stuff," Cordola says. "You know, these are songs of compassion and hope and healing." The former arena rocker, who has played guitar with Guns N' Roses and the Beach Boys, now devotes himself to teaching music to Kabul's street kids. Cordola has been moving between L.A. and Kabul for the past three years, toting donated guitars and a desire to turn around some young lives. In 2010, Cordola's own life changed. A friend who had been working with Pakistani musicians invited him to come along and join the collaboration in various parts of Pakistan. During one of Cordola's visits, in 2012, he read a New York Times article about two girls who'd been killed in Kabul. The girls, Parwana, 11, and Khorshid, 15, had been selling trinkets on the street with their seven-year-old sister Mursal. As the older girls went in one direction and Mursal headed a different way, a suicide bomber struck, killing Parwana, Khorshid and five others. Touched by the story, Cordola says he felt compelled to reach out. So in 2014, with the help of a translator, he tracked down Mursal and her family in Kabul. He found them living in poverty — five children supported by Mursal's mother, a police officer. Their father, who had a drug habit, had abandoned them. "I had no idea it was going to turn into this thing that we're doing now," he says. "And when I brought a guitar on one of the visits, [Mursal] wanted to learn. And so I just kept coming back, and eventually they started bringing more friends, and we would drive around and we'd see all these girls on the streets." And thus was born Kabul's Miraculous Love Kids music school. It's a nonprofit supported through benefit concerts, private donations and a GoFundMe page. This being Afghanistan, my conversation with Cordola is interrupted by the roar of helicopters flying to the airport, where incoming missiles have exploded. And so we move indoors for some quiet. Sixteen-year-old Madina Mohammadi (right), with Mursal, never attended school before teaming up with Cordola. The guitar lessons "teach me a little bit too about life," she says. There is a new rehearsal space for the group, which has grown to 60 kids, most of them girls, ranging in age from six to 16. Their previous rehearsal spot was badly damaged last May by a massive truck bomb that wrecked parts of central Kabul and killed more than 150 people. With her acoustic guitar perched on her lap, Mursal, now 13, settles into a sofa. She's a star pupil who is polishing her English, dressed in a scarlet headscarf, pink shirt and denim vest. With a broad, dimply grin, she sparkles. Her answers to my questions come quickly and with confidence. Which does she prefer — Afghan music or rock? "No, me like rock music." Does she like performing for an audience? "Yes, of course, me like it." And, she says, she wants to share what she's learned — to become the best guitar teacher in the world and instruct other girls. Mursal and her bandmates now have a repertoire of around 20 songs, including tunes by U2, Coldplay and the Foo Fighters. But "Fragile" by Sting is their favorite. As six kids assemble for after-school practice and start strumming the tune, it becomes obvious that stadium shows are down the road a bit. But the girls have played for the Spanish ambassador, an Afghan brigadier general and other dignitaries. It is highly unusual for young women to be playing rock 'n' roll in Afghanistan, especially in public. But Cordola says he met with very little resistance from the families, in part because his foundation is paying for schooling for many of these kids. And sometimes the help goes even further. In addition to funding tuition for Mursal and her two surviving sisters, Miraculous Love Kids is also assisting the family with housing and other essentials. 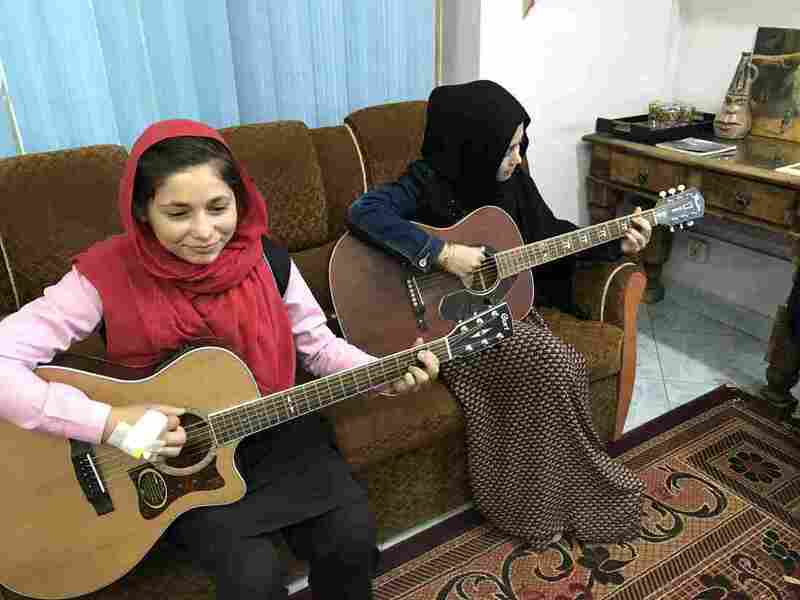 Sixteen-year-old Madina Mohammadi, the other guitar star of the class and a former street kid, had never attended school before teaming up with Cordola. Now, she says, she's learning English — and some other things. "Mr. Lanny tell me something good about life, and guitar teach me a little bit too about life," she says. "About feeling." To which Cordola adds: "What we're trying to do with music is not singing and dancing and fancy stuff. You know, these are songs of compassion and hope and healing. Because these people suffered a lot here. And continue to." Next up for Kabul's guitar girls: learning bar chords, composing some original tunes and working with a couple of marquee musicians. Through Cordola, the Beach Boys' Brian Wilson has taken an interest in the group and has invited Mursal to visit him in the U.S. So far, her visa has been denied. But Wilson has sent over voice and music tracks for his song "Love and Mercy" that the girls have mixed with their own. It's now part of the the Miraculous Love Kids' first-ever professional collaboration.